Menopur is a combination of FSH and LH hormones which are integral to ovarian health. Menopur is a very refined and purified form of HMG, which assists the follicle to produce eggs, as well as encourages the maturation of the eggs once they are released. This is indicated for women who are otherwise very healthy, but are just not producing enough eggs, or eggs are not maturing as they should. 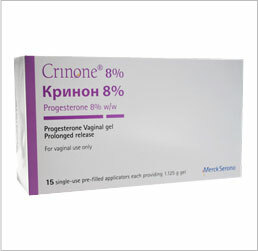 Normally, this IVF med is prescribed along with other IVF drugs to drastically increase the chances of conception. 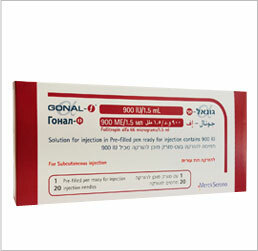 Menopur is one of many high quality infertility medications offered by IVFPrescriptions. Of the infertility drugs on the market, Menopur 75 IU has a successful track record resulting in pregnancy, especially when combined with other medications. 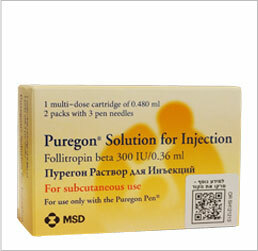 Menopur is indicated for patients who are currently engaging in an ongoing IVF series of treatments. 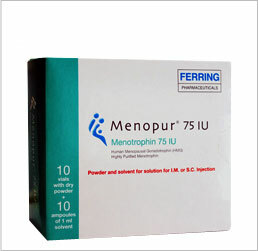 Menopur 75 IU is one of many IVF meds that are indicated for use in treating infertility. Because we offer only the top branded IVF medications we are able to help you save on the Menopur price, (save up to 54%) over most others in the same market. Menopur, used as part of the overall IVF treatment, and in conjunction with other IVF drugs, can have one or more side effects. Most women only experience mild stomach pain, headache, bloating, pain at the injection site, slight dizziness, or breast tenderness. Symptoms requiring medical intervention include fever, chills, flu like symptoms including joint pain, weakness, slurred speech, swelling in the legs, impaired vision, chest pain, or hyperstimulation syndrome. If there is severe pain in the lower abdominal area, rapid weight gain, uncontrollable vomiting, or unusual changes in the urine, seek medical attention immediately.